When people have their own idea of right and wrong, they may do terrible things but think they are doing what is right. They work to find ways to hide what they have done from God and maybe even from themselves. When God asked Adam, “Where are you?” Adam said that he hid from God because he was naked and afraid. Last week we discussed how today we have become more adept at hiding and using more sophisticated images as our covering. We will do almost anything to keep hiding behind our image and so will people who are doing horrible things. Gangsters try to maintain a family image; many even go to church and have their children baptized. They hide behind an image as all of us are inclined to do. We deal with sin by trying to hide it. No one does that more often than church people. We do what we need to do to maintain our image so others will think we are the good people of the world. The first thing God does to redeem us is to help us stop hiding and face Him directly. He doesn’t help us become better at hiding; He brings us into the open. In yesterday’s officer training class I was reminded again of what is required to be a church member. We need only to believe that we are sinners in the sight of God and without hope except for what Jesus has done. We are to trust in Him alone for our salvation. If you want to keep maintaining an image of goodness, then Jesus really doesn’t have much to offer you. You would be better off joining a country club or service club and not joining a church. Joining a church requires that you admit you are a sinner. Several years ago while a student at the University of Miami, I talked to a young woman about Jesus. I began by talking about sin and she said, “I don’t have any sin in my life.” She said that she wasn’t as yet completely perfect, but believed she soon would be. There was no use telling her about Jesus, because Jesus only has something to offer to sinners. If you aren’t a sinner, then you don’t need Jesus. As the old saying goes, a church is a hospital for sinners not a rest home for saints. It is a place where sinners can find forgiveness before God and find help in living a new life. The first thing Adam and Eve had to do was to come out of hiding. They next tried another of our favorite ways of dealing with sin. They blamed someone else. When God asked Adam if he had eaten of the forbidden fruit, Adam said, “The woman whom you gave to be with me, she gave me the fruit from the tree and I ate.” Adam blamed the woman and then he blamed God for giving her to him. A few verses earlier he had praised God for the woman, saying that she was flesh of his flesh and bone of his bone. Now, when he was caught doing the wrong thing, he blamed her for leading him astray. The woman did the same thing. She said the serpent deceived her. Blaming someone else is a favorite way of dealing with what we have done wrong. We need to get over that; God only works with our sin when we face it directly and take the blame for what we have done. Blaming is still very popular today. People in a bad marriage always talk about how bad the other person is. I seldom hear anyone say how badly they are behaving in their marriage. When there are problems between parents and children, kids don’t say what bad kids they are, and parents don’t say what bad parents they are. We always say how someone else is to blame for our problems. Except for just getting it off our chest, blaming others doesn’t help very much. We have very little control over what another person does; we can only control what we do. Even if we are only ten percent at fault and the other person is ninety percent at fault, we need to deal with our ten percent. Blaming is really just another way of hiding and sooner or later we need to face our sins. God had interesting choices as to what he could do with Adam and Eve. Jesus gave the illustration that when a potter makes a bad pot, he has every right to smash it and start all over. Had I been in God’s spot, I would have acted like the potter and destroyed Adam and Eve and started all over again, but God didn’t. He took the much harder route and decided to redeem them. That proved to be very costly. As soon as He decided to redeem them, that meant that He put Jesus on the cross. Not to destroy them meant He had to pay the price of redemption. God did make some changes in Adam and Eve’s life and I think that teaches us what happens when we sin. God didn’t change Adam and Eve’s basic nature as He did with the serpent. The serpent was made into a different creature. It could no longer talk, as he had to Eve and it was forced to crawl on its belly in the dirt. The serpent was also a representative of Satan and God said that the offspring of Adam and Eve would eventually crush his head. That is the first picture of redemption given by God. Satan will always have power, but he will eventually be crushed. It doesn’t look that way most of the time. Evil looks as though it is growing more and more powerful every day. The world appears to be getting worse; yet it is good that seems to be getting crushed. Satan’s striking at the heel seems to be going pretty well. Youth appear to be getting further and further away from Jesus. Older people don’t want to make the commitment to teach them about Jesus. They are more concerned with pursuing their own pleasure. Evil appears to be winning. In the Book of Revelation, John describes evil as a gigantic beast with ten heads and ten horns. His only opposition is good, which is represented by a wounded baby lamb. It looks like it will be a slaughter and it will, the lamb wins. I keep this little statue of a lamb on my desk to remind me what good looks like and that it does not look very powerful. It looks like the beast will utterly destroy it, but the truth of the Book of Revelation is that good will win. All that evil can do is strike are our heel for Jesus has crushed Satan’s head. Satan only has the next to the last word; Jesus has the last word. 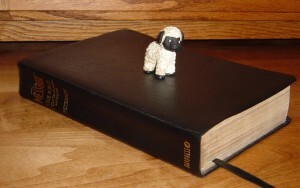 If you are seeking to proclaim Jesus Christ, you have to stay pretty close to the lamb. If you start looking at the world, it will look like an unbeatable beast and you will be crushed by it. We need to keep looking at God so we can be reminded that the lamb wins. God didn’t make Adam and Eve into completely different creatures, but He did make their lives more difficult. The woman would now experience increased pain in childbirth and the man’s work would not easily be done. No matter what he chose to do, man’s work would be hard. We need to accept the fact that giving birth and raising children will be very hard. Any work that is worthwhile will also be difficult. No matter what we do, it will be hard and discouraging. This shows what happened when we sin: we do not get crush¬ed, but our way is hard¬er. Sin causes out lives to be much harder than it normally would be. Sin looks easy and we think taking the easy way will make our lives easy. It doesn’t. Sooner or later, it makes our lives much harder. It may look easy not to bother studying, but then when we are grown we find we can’t make a decent living. If we could remove sin from our lives, our lives would be easier and better. Satan tells us that it is the other way around. However, taking away our sin and the sin of those around us would make all of our lives much easier and better. It is the restrictions that God puts on our lives that makes our lives fuller, richer and, in the long run, easier. It is incredible that God didn’t give up on the human race. It was His decision that we be redeemed. We need to make sure we don’t give up on ourselves. We often see how we are not doing very well or aren’t understanding what God is doing. That may be true, but God is in the process of redeeming us. He brought His life to us in Jesus Christ. Just as He took dirt to form Adam and then breathed into him the breath of God, so He breathes His life into us through the coming of His Spirit. God could have crushed us as a potter does a bad pot, but He didn’t. He chose the hard road of redemption. There are people in your life who always seem to be working against God and against you. Remember that God is seeking to redeem them. He has the power to make everything new. You may be the one causing the problem; you never seem to get anything right. Remember that God is redeeming you. God didn’t give up on Adam and Eve. He didn’t make them like serpents crawling in the dust, and He doesn’t give up on you. It may look as though the beast is winning but the truth is, the lamb is bringing redemption in you and making you into a new person.